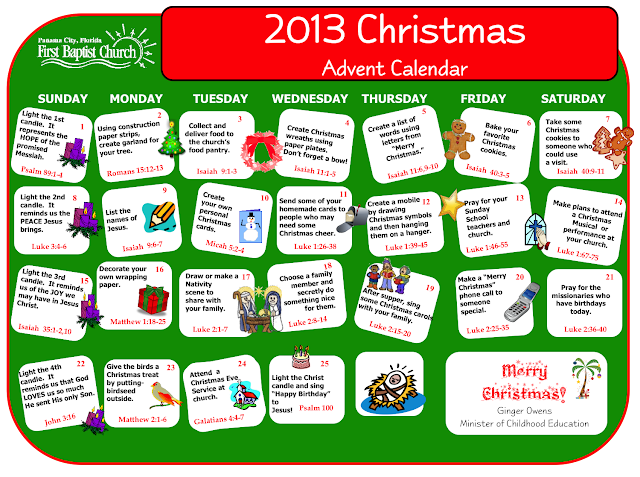 A Kids Advent calendar and wreath is a great way to help celebrate and teach your children the importance of Christ's birth. Since we celebrate Advent during the four weeks leading up to Christmas, and because Thanksgiving has come so late in November this year, you have to get ready to begin as soon as you finish celebrating Thanksgiving. Here are some suggested Kids Advent activities you can use to celebrate the birth of Christ together as a family. The Advent Wreath was once the center of family devotions and the Advent celebration. Consider making an Advent wreath as a part of your Kids Advent celebration. This project will give families the encouragement to follow the custom once more and show children what Christmas is truly about. Use a pre-formed ring (Styrofoam, wood, grapevine, metal, or purchased) for the base. Cut or drill four holes for candles evenly spaced around the ring. Cover the base with evergreen (live or artificial); using craft wire or a hot glue gun secure the candles in the wreath. Use four purple (or three purple and one pink) candles and a central white candle on Christmas representing Christ. Note: The third candle (shepherd’s candle) usually is a pink candle. Here is what you need to make a no-flame Advent Wreath: Needed are 4 cardboard paper towel rolls (cut the size of a toilet paper tube), 1 cardboard paper towel roll (cut 1/3 of it off), glue, yellow tissue paper, purple, pink, white, and green paint, a Styrofoam disk, and small pine branches (real or artificial). Drip glue down the sides of the paper towel rolls. Drip from the top of the roll and allow the glue to run down the sides (this will make a dripping wax effect on the “candles”. Allow to dry. Paint 3 rolls purple and 1 pink and the larger one white. Paint the disk green. Allow to dry. Carefully push while twisting the rolls into the disk. Place the greenery around the cardboard rolls. Push yellow tissue paper into the cardboard rolls and pull up to “light” the “candles”. I hope these ideas will help your family have one of your most meaningful Christmases ever! Feel free to share these ideas with other friends and family.